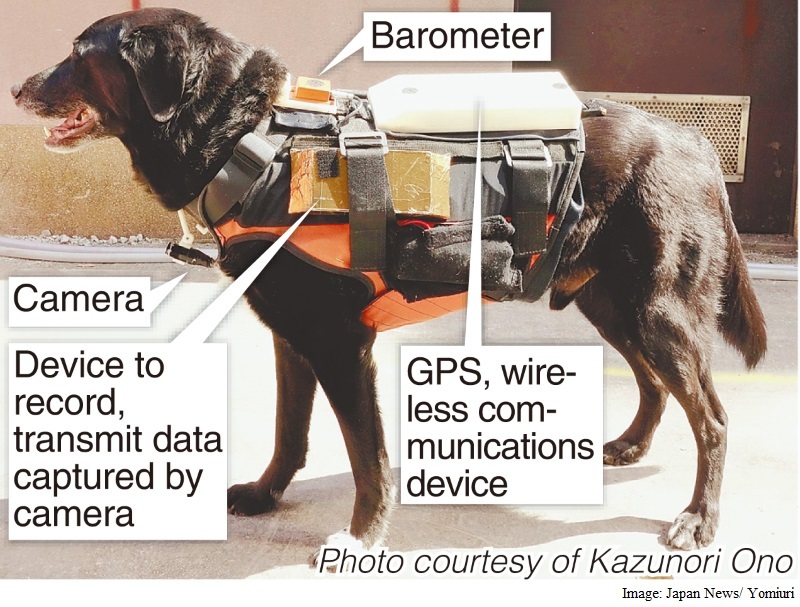 Scientists at Tohoku University and other institutions have developed a system featuring a high-tech vest that can be attached to search dogs and transmit information from rescue sites through its camera, global positioning system and other devices. Subsidized by the government, the “rescue robodogs” system was developed by a research team led by Kazunori Ono, a 39-year-old associate professor at Tohoku University. Dogs are said to have a sense of smell 100 million times more acute than that of humans. The robotic technology is expected to complement this ability and speed up rescue missions during emergency situations. The scientists intend to put it to practical use within several years, after completing verification tests. The development project began one month after the 2011 Great East Japan Earthquake. The quake was followed by a large number of aftershocks that made search missions in disaster-hit areas more difficult and gave rise to concerns over rescue teams being caught in secondary accidents. Learning from the situation, the researchers set out to improve the capability of rescue dogs. The “rescue robodogs” system includes a special vest that can be strapped onto a dog. The vest weighs about 1 kilogram (2.2 pounds) and is equipped with a GPS device, a barometer, a battery and other devices. A small camera is attached separately under the dog’s neck. A medium-size dog weighing about 15 kilograms with vest could work for about two hours, according to the research team. The system uses the Internet to transmit visual images and sounds from the area around the rescue dog to personal computers or mobile devices. The GPS installed on the vest allows the dog’s route to be displayed on a digital map. The GPS function is expected to facilitate nighttime searches and searches at collapsed houses and other places not easily accessible for humans. In collaboration with the Tokyo-based Japan Rescue Dog Association, since last summer the research team has been examining the system’s effectiveness at facilities like a dog training center in Fujimi, Saitama Prefecture. At the center, dogs equipped with the high-tech vest engage in disaster simulations, searching for people buried under mock half-destroyed houses or rubble. The system has attracted attention from police and firefighters, who have sent officials to training sites to observe verification tests. The research team has improved the system to allow handlers to remotely give instructions to dogs via wireless radio while monitoring footage sent from the camera on the dogs. Rescue dogs are trained to use their excellent sense of smell to find people buried under collapsed houses or earth and sand after earthquakes and landslides. Labrador retrievers are often used for this task, and are also naturally suited for work as police and guide dogs. Police dogs keep their noses to the ground to sniff out clues, while rescue dogs point theirs upward to sniff smells in the air. According to the Japan Rescue Dog Association based in Tokyo, about 40 groups across Japan, including nonprofit organizations, currently raise rescue dogs, and about 120 dogs have so far been certified by the association for dispatch to sites based on an agreement the association concluded with firefighters and local governments.